During an appearance on Jimmy Fallon, Post Malone previewed a new single titled "Sunflower." The song was later revealed to be a collaboration between both Post Malone and Swae Lee. After the "Guatemala" singer previewed his piece of the song, he's now revealed when we could expect to hear it in its entirety. 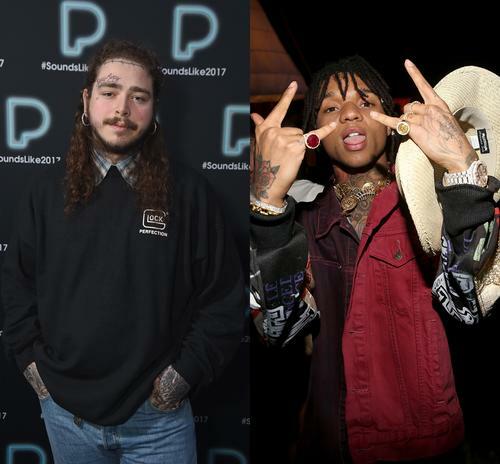 Post Malone and Swae Lee are gearing up to bless us with a vibe this week. Swae Lee took to Twitter to announce that "Sunflower" will drop this Thursday. "It's going to be a big song, like, this song is really dope. The vibes, never seen before. All original, the beat is crazy. It's just really majestic. It's a majestic record," he said. "So this Thursday. Can y'all mark your calendars for me? Please? Thank you." Post Malone and Swae Lee's collaboration is set to appear on the soundtrack for the upcoming Spider-Man: Into The Spider-Verse. It's been a major year for both artists. Posty released his highly anticipated sophomore album, Beerbongs & Bentleys while Rae Sremmurd released their triple disc Sr3mm which featured Swae Lee's first solo endeavor, Swaecation. Both Swae and Post also collaborated earlier this year on Beerbongs & Bentleys for the song "Spoil My Night" which was an immediate highlight off of the album. We're excited to hear what the two have in store on their upcoming collaboration.